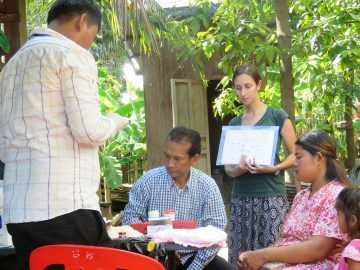 Congratulations to alumna Aviva Rappaport, whose paper “A randomized controlled trial assessing the efficacy of a reusable fish-shaped iron ingot to increase hemoglobin concentration among anemic rural Cambodian women” has been published in the American Journal of Clinical Nutrition. Rappaport conducted this research while completing her Master of Science in Human Nutrition in the Faculty of Land and Food Systems (LFS), under the supervision of Affiliate Professor Tim Green. She also previously completed her Bachelor of Science in Food, Nutrition and Health at LFS. Specifically, Rappaport’s research evaluated the efficacy of the Lucky Iron Fish in rural Cambodia in a year-long randomized controlled trial. The Lucky Iron Fish is an iron ingot meant to be added to cooking pots, mimicking the iron-releasing mechanism of cast iron pots and pans. In this research, Rappaport discovered that the prevalence of iron deficiency varied with different biomarkers and that there is a low prevalence of iron deficiency in Cambodia based on serum ferritin concentrations, an appropriate measure of iron deficiency. These findings are consistent with other research findings from Cambodia, including work done by LFS Assistant Professor Crystal Karakochuk. Importantly, after six months of participants using the Lucky Iron Fish versus iron supplements, Rappaport found that serum ferritin concentrations were lower in the participants using the Lucky Iron Fish compared to those taking iron supplements. These findings were not maintained after 12 months. Rappaport’s conclusion was that the use of the Lucky Iron Fish should not be recommended in Cambodia or in countries where the prevalence of iron deficiency is low and genetic hemoglobin disorders are high. Aviva Rappaport is currently working as a Research Assistant at the Centre for Global Child Health at SickKids Hospital in Toronto, ON. In addition, she works as a consultant for the HEmoglobin MEasurement (HEME) working group within SPRING Nutrition.